I call this the Happy Days kitchen. 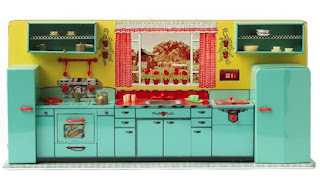 Its optimistic color scheme [note the jazzy red appliance handles] reflects the feeling of the 1950s; all the conveniences of the New Era are in place. The view of farm fields outside the 'window' I find both touching and telling: Even as society was racing towards modernity, it looked for reassurance to the agrarian past.